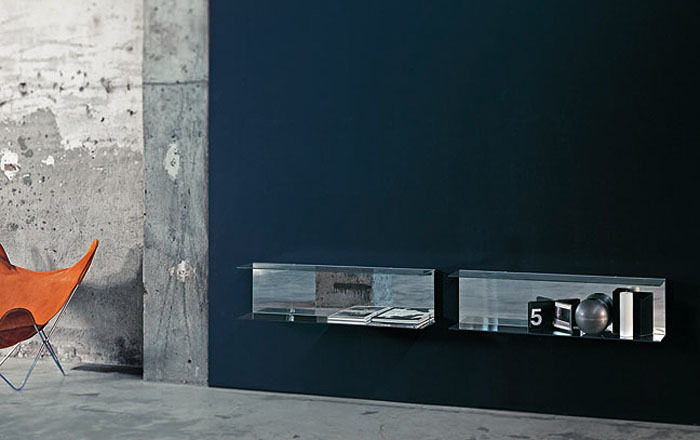 The Easy wall mounted shelving was designed by Nanda Vigo for the prestigious Glas Italia in Macherio, Italy. This is a series of shelves with mirror and 0.2" (6mm) tempered glass shelves with bevelled corners, available in transparent extralight glass. In addition to sustaining and containing, this shelf is characterized by its formal purity and lightness and as well as by its reflecting function. The Easy wall mounted shelving creates an illusion of space with the placement of the mirror behind. Available in three sizes.